he ultimate summer band returns to New Zealand in 2019 with a series of shows to celebrate their 40th Anniversary. That’s right – it’s a UB40TH! 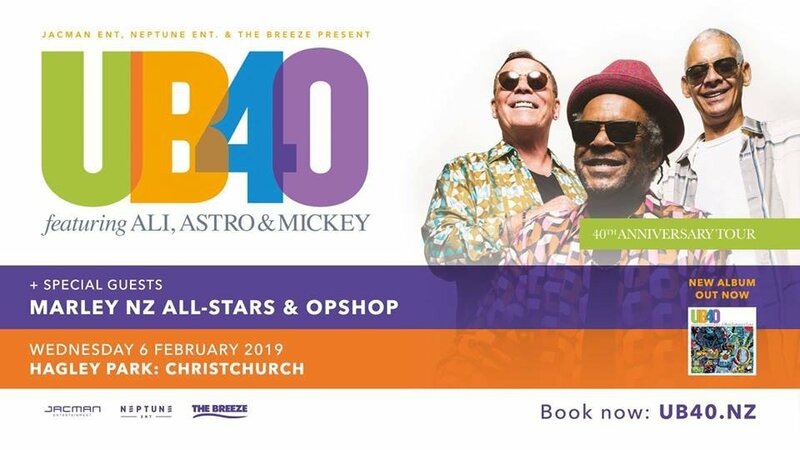 UB40 featuring ALI, ASTRO & MICKEY will headline a very special Waitangi Day concert in Christchurch's Hagley Park and will be joined by supergroup, the Marley NZ All-Stars and the much-loved Opshop! With 2019 marking 40 years since UB40 first performed live, the reggae icons will be celebrating with a ‘greatest hits’ set that features global smashes including ‘Red Red Wine’, ‘Cherry Oh Baby’, ‘Rat In Mi Kitchen’ and ‘Kingston Town’. Ali, Astro & Mickey will be joined on-stage by their incredible eight-piece band.